Tree Removal Services after severe storms in the North Shore area. Each year, the risk of damaging severe storm events increases for areas in Sydney, affecting areas such as the North Shore with heavy rain and destructive winds. The role of the professional tree removal services are in high demand during this time as fallen trees deny North Shore residents access to roads and property. The message from Sydney local councils is to practice caution and avoiding floodwaters and fallen power lines, two of the biggest threats to safety, during wild weather events. Emergency tree removal services often prove to be difficult jobs. They require special attention to limit further damage and ensure your safety. Many dangers may be present, including exposed electrical wires, dislodged hanging branches and damaged, structurally unsound trees. Bradshaw Tree Services have been developing true excellence in tree management for over 15 years, building a wealth of experience and expertise in handling these emergency tree removal situations. 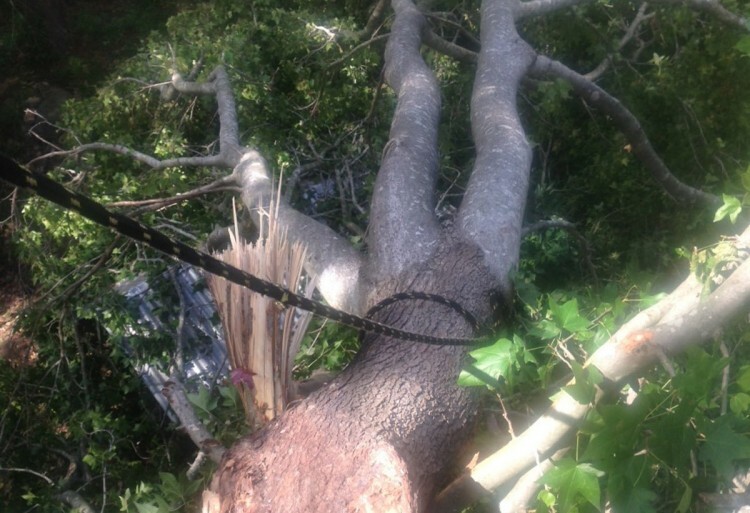 Bradshaw Tree Services can be contacted on 04 0357 2113 to arrange for tree surgeons to clear fallen trees and to safely dispatch dangerously positioned tree branches after severe storms. Council can only clear debris from trees or branches that have fallen onto public property or branches from street trees that have fallen on private property. If you have debris on your property from your own trees, it is the responsibility of the property owner to remove it. It’s advisable to gain the assistance of an appropriately qualified and insured tree services contractor such as Bradshaw. The New South Wales State Emergency Service (SES) recommends that residents should take advantage of this advanced notice to prepare themselves, their families and their homes for heavy rainfall and strong winds. – Check any drains in your garden, driveway or paths. Ensure they are clear of leaves and other debris, and are free-flowing. – If your home has experienced flash-flooding in the past, source sandbags from hardware stores and prepare them so you can block water entering through doorways. – If your home has a drainage pump in the basement, garage or under the house, ensure that it is working and clear of debris. – Inspect trees near or hanging over your home and driveway. Look for broken branches. Consult a tree services contractor for advice if needed. (NSW SES does not provide a tree removal services). Call Bradshaw on 04 0357 2113 for a quick assessment of your situation. NSW State Emergency Service (SES) is an emergency and rescue service organised to provide assistance to the community. The organisation relies on a network of approximately 9000 volunteers state-wide. The volunteer-based service provides emergency assistance to the people of NSW 24 hours a day, seven days a week, 365 days a year. NSW SES also play a supporting role for other emergency services when they are performing major operations; services that include NSW Police Force, the NSW Rural Fire Service, Fire and Rescue NSW and the Ambulance Service of NSW. While the major responsibilities of the SES are for flood and storm emergencies, NSW SES also provides the majority of general rescue effort in the rural parts of the state, for road incidents, climbing rescues and emergency searches in bushland.